The Lakes take their names from the former owner of the land, the Duke of Newcastle, and the History surrounding them and they run alongside the River Maun. 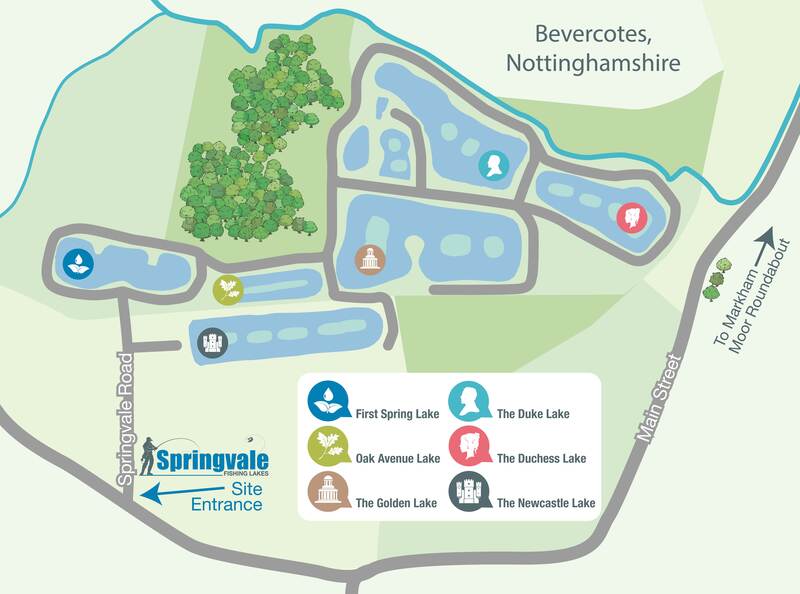 The first lake created at Springvale Fishing Lakes, built over a natural spring. Open now, the Lake holds 27 pegs and offers day fishing and club matches. Well stocked with Common and Mirror Carp and a variety of Silver Fish. This lake has 20 pegs, and is set in a picturesque setting overlooked by an avenue of oak trees. Open now for day fishing and club matches. This looks up to Golden Hill where you can see the Milton Mausoleum..
Open now, the Duke Lake takes its name from the former land owner The 4th Duke of Newcastle, Henry Pelham-Clinton. A pleasure or match lake with 40 pegs stocked with carp and a variety of silver fish. Takes its name from the Duchess of Newcastle, Georgiana Elizabeth Mundy. Holds 30 pegs. Stocked with Mirror and Common Carp up to 20lb and a variety of Silver Fish. Takes its name from the Duke and Duchess of Newcastle. Stocked with Mirror & Common Carp and variety of Silver Fish. Holds 60 pegs for pleasure or match fishing. Day fishing for one rod is £6.00 per day. Could we politely ask you to follow the Rules & procedures below to protect the well being of the fish and the Lakes and enable us to create a safe venue. Anyone found to using a barbed hook will be banned for life and asked to leave immediately. * Springvale Fishing Lakes takes no responsibility for any person’s or their tackle when using these premises and vehicles are left in the car parking areas at your own risk. And the management reserve the right to ask anyone to leave if they are intentionally violating the rules and procedures.